“Did you like my product/Service? feel free to contact and book your appointment”. online appointment scheduling works faster with fewer efforts, as it not includes any phone call, You can directly select a date, time and place according to your comfort zone. In this post, we have collected best WordPress appointment booking plugins, which will help you to have best and user-friendly booking system for your business. Whether you run a salon, a hotel, Medical clinic or any other business, a quality appointment booking system will help you in smooth-running of your business. We, run into a solution to have an appointment fully integrated into WordPress website, getting more control over customer data. Let’s take a look at the booking plugins that will make it easy for your users to book an appointment directly from your website. WP Simple Booking Calendar is known for booking calendar to show the availability of your holiday home. It has a Simple user-friendly interface, You can simply create a calendar and then it to a post or page using the shortcode. It allows you to create an unlimited number of booking and define the kind of fields you want on the form but to book an entire day. This means there are no hourly time slots. Once the appointment is booked, both admin, as well as the user, will receive a notification. It also comes with booking form captcha which you can enable or disable as per your choice. You can integrate PayPal with the payment option and a lot more. Also, it is a slightly different plugin from others that don’t sync with Google Calendar. BirchPress is considered for the easy online appointment plugin. It offers an option of booking form that can be embedded in a page or post via shortcode. It is also, integrated Google Calendar or iCal, iPhone, Android, Outlook that helps in syncs of your booking calendar and imports or exports your appointments and availability automatically. BirchPress add a professional online booking management system into your WordPress site and helps in easily configure notification emails that are sent when an appointment is booked, rescheduled and cancelled. It accepts the online payment so that users can use their PayPal or credit/debit card for the payment. It comes with a calendar view for both you and your website visitors. You can easily add your booking/appointment form into any WordPress post or page. It is also very powerful and fully flexible functionality plugin, has an intuitive user interface and comes with a whole range of options that can be configured from the plugin’s settings page. It is another effective plugin, that allows you to add an appointment booking management system into your WordPress site. This plugin is highly known for its ranking in WordPress directory and You can directly add the Plugin by unzipping its Shortcode into your WordPress page or post. Use shortcode [APCAL] to insert a calendar into any post or page. Use shortcode [APCAL_MOBILE] for Mobile devices. It is a powerful, flexible and feature-rich plugin that allows you to accept, set and manage your bookings on your blog. Cool! when everyone runs for the easy and fast solution here comes Gravity Form. 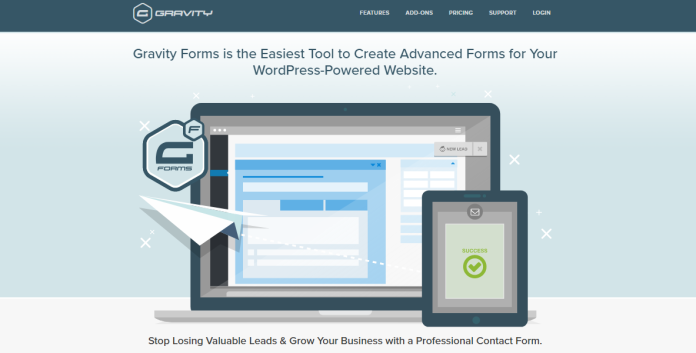 it is known as the easiest tool to create advanced forms for the WordPress powered blog. Gravity Forms features allow you to drag-drop interface so, if you have this plugin you can create own customize the form. Moreover, it provides a support for notification in order to send confirmation email automatically. Gravity Forms allows you to quickly and easily integrate with a variety of third-party services such as PayPal. Cool! Now you all have the idea about the 5 best WordPress plugin list. As we know WordPress appointment booking is clearly on a rise and easy and smooth for customers who want to fix their appointment on your website. Hey Ekta! Thanks for sharing. You can try one more WP plugin called – All In One Reservation. It is a powerful plugin for reservation management system. by using this plugin you can setup any reservations easily, quickly and pleasantly.